This is another Chef Kate recipe and it was very good! 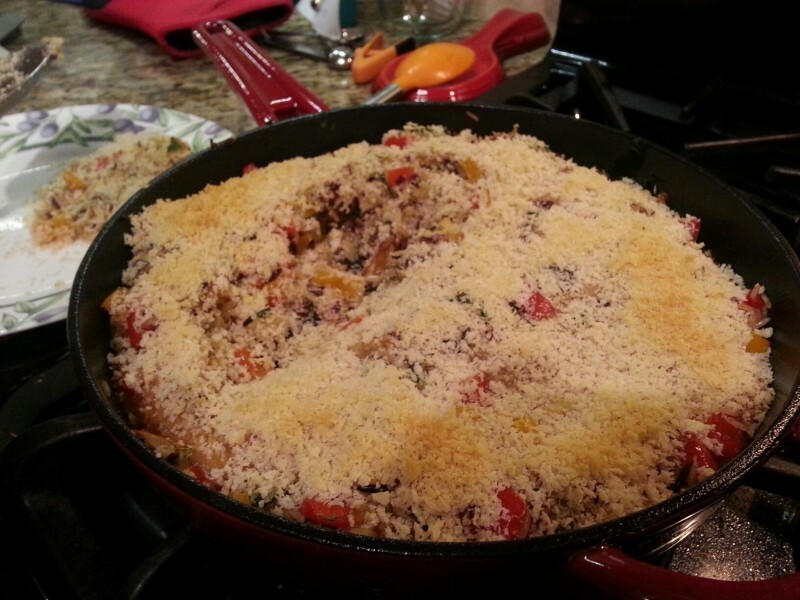 We had just purchased a cast iron skillet and seasoned it and gave this recipe a try. I will post the original recipe and the changes we made in purple. I usually don’t make so many changes to a recipe, but we had our personal taste preferences and dietary issues. This is a solid recipe that you can easily change to suit your needs. For the wild rice preparation, we cooked it according to the bag’s directions, which was less water than stated below. We bought the cheese in a chunk at the deli and shredded it ourselves. 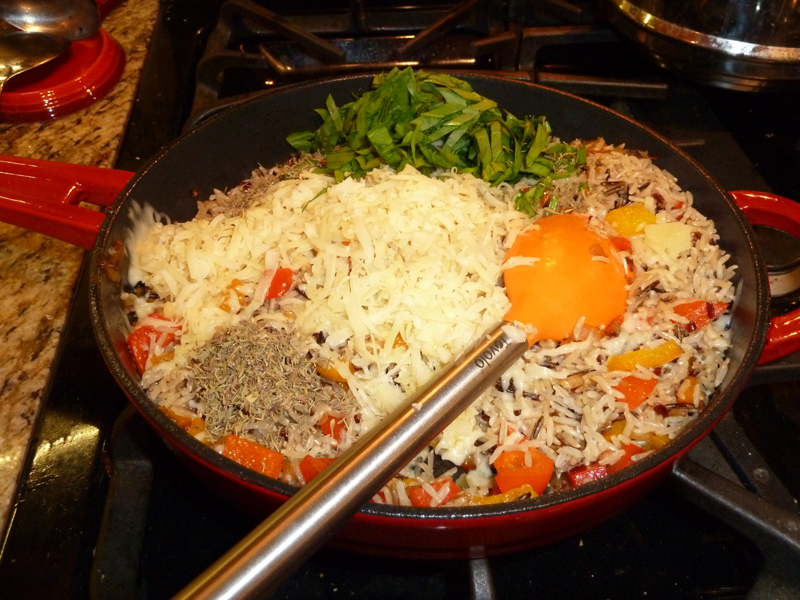 Wild rice blends are fine too. Enjoy! Cook the rice. Preheat oven to 375°. In a large (10″ or larger) cast iron skillet, melt the butter over medium-high heat. Saute the onions for about 15 minutes, or until they start to caramelize. Stir in the mushrooms (or peppers) and let cook another 5-7 minutes. Turn off the burner. Carefully stir in the cooked rice, Swiss chard (or spinach), Swiss cheese, thyme, salt and pepper. Stir all together. Add in the last 1/2 cup of vegetable stock. This is a really neat recipe. You get that mashed sweet potato flavor with spices, added sweetness (optional), and beautiful golden marshmallows. Next time I will half it for my family of three because it makes a lot (I forgot); it serves about 8 people. The cinnamon and brown sugar are ingredients I added because I thought it’d be better with them. I used about 3 large sweet potatoes, but weigh them please! If you need a great masher that’s easy to clean, look here: OXO Masher. ENJOY!!! **Known IC irritants, tread carefully! To make this IC safe, omit the cinnamon and be careful with all spices. Place sweet potatoes in large saucepan or pot, and cover with cold water by 1 inch. Salt generously. Bring to a boil, reduce to a simmer, and cook until easily pierced with the tip of a paring knife, 15-20 minutes. Drain, and return to pan. Heat over medium, stirring, until liquid has evaporated and a thin film covers the bottom of pain – about 2 mintues. Remove pan from heat, add milk, butter, nutmeg, and optional cinnamon and sugar. Mash until smooth, season with salt. Transfer mixture to a 2-qt. baking dish. (To make ahead, refrigerate up to 1 day). 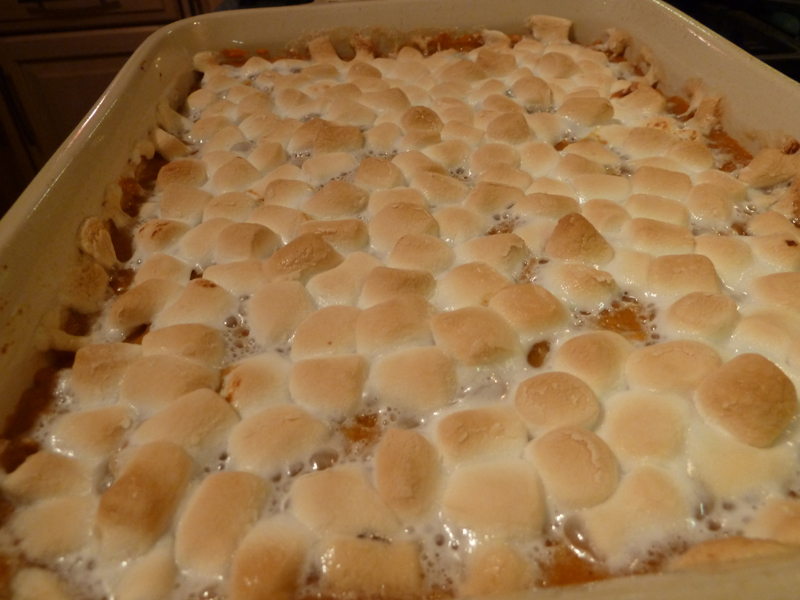 Top casserole with marshmallows, bake until center is warmed through and marshmallows are lightly browned, about 15-20 minutes. This is my first braising and I’m very glad I did it. It’s Le Creuset’s braised short ribs. It came out SUPER fork tender and falling apart. As you can see it made an awesome and plentiful sauce. 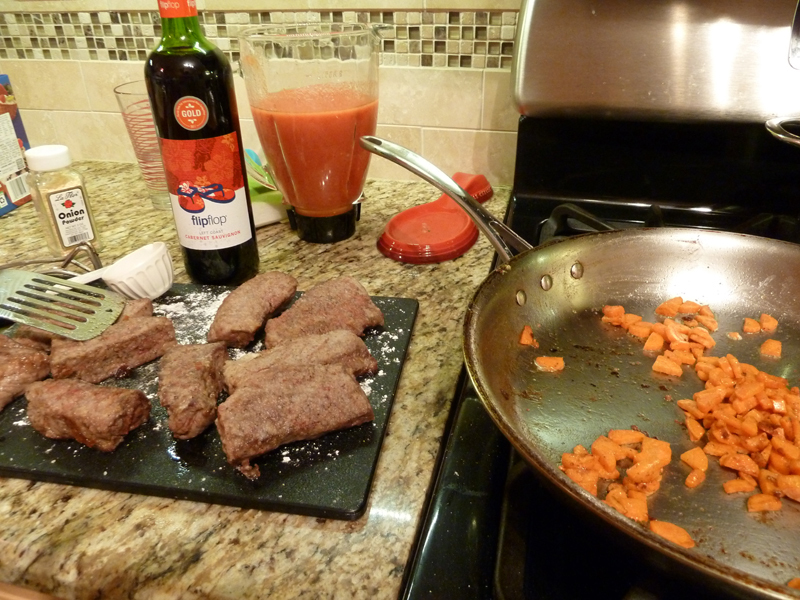 The smell of the red wine mixing with the blended tomatoes is wonderful. Changes: we used onion powder versus raw, omitted the noodle side dish, and omitted the gremolata. **We don’t have a braiser so we used a 12″ steel pan for the stovetop cooking and a Le Creuset rectangular baker for the oven part. It turned out fine. I’d say it serves more like four people. Highly recommended! Liberally coat the short ribs with salt and pepper. Dredge in flour and shake off any excess. Place the braiser over high heat. When it’s very hot, add 1/4 cup oil and reduce the temperature to medium-high. When the oil is hot and shimmering, add the short ribs and cook on all sides until browned. 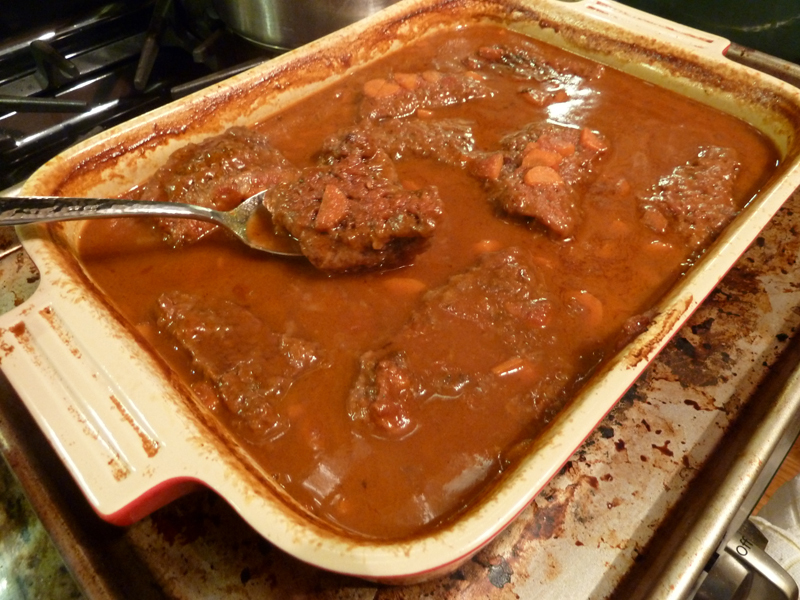 Remove the short ribs from the pan and rinse the oil and flour from the braiser. Return the pan to the burner, reduce the heat to medium-low, and add the remaining oil. Add the onion and carrot to the pan and cook until they are nicely browned, about 15 to 20 minutes. The browner the vegetables, the more flavorful the sauce. Return the short ribs to the pan and add the wine. Raise the heat to medium-high. Blend the tomatoes (either in the can with an immersion blender, or in a standing blender) and add the puree to the braiser. Add a teaspoon of salt. Add the bay leaf and bring to a simmer. Cover the braiser with the lid slightly ajar and place it in the oven. Cook 3 to 4 hours or until the ribs are very tender. When ready to serve, cook the noodles as recommended on the package, return them to the pot and toss with the butter. Divide the noodles among 8 plates. Set a short rib beside or on the noodles. Skim any clear fat that has risen to the top of the sauce and discard. Spoon the sauce over each rib. Garnish the ribs and sauce with gremolata. 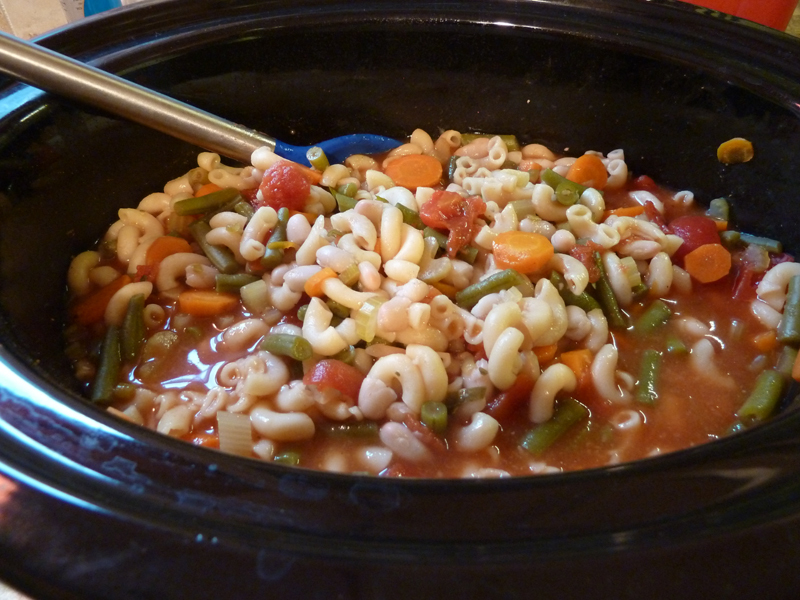 This minestrone soup stays simple and is very fresh and nice. I’d suggest reducing the pasta to 1 cup of raw pasta. Ditalini would work best but at the time I couldn’t find it. So I don’t know if the elbows puffed up more than ditalini would have, but I’d guess, even using ditalini, it’d be better using 1 cup of raw pasta. We had just come from the apple orchard farm and bought fresh green beans, they were great. If you don’t like a certain veggie or prefer another one (like zucchini or spinach), add it on in! Enjoy!! It says it makes about 6 servings, but it depends. 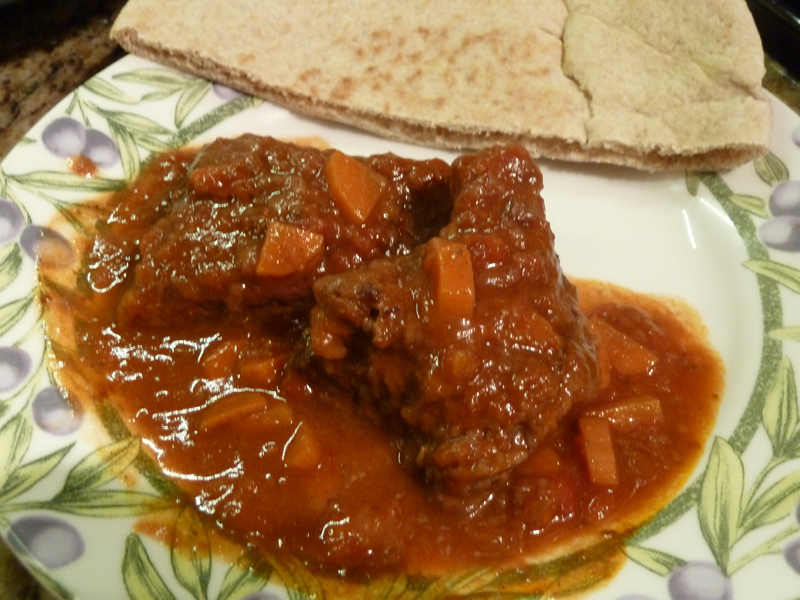 You could easily halve this recipe to test it out or make for a smaller amount of people! 2 cups pasta, like ditalini or shells, (I suggest using 1 cup raw, estimate how much you think you’ll like). Chop the carrots, onion, and celery fine. Place the carrots, onion, and celery, plus all the other ingredients (except pasta) in the slow cooker. Cook on high for the first hour, then turn to low and cook for a few more hours. Add the pasta in for the last 20 minutes of cooking and test a piece before turning the slow cooker off. 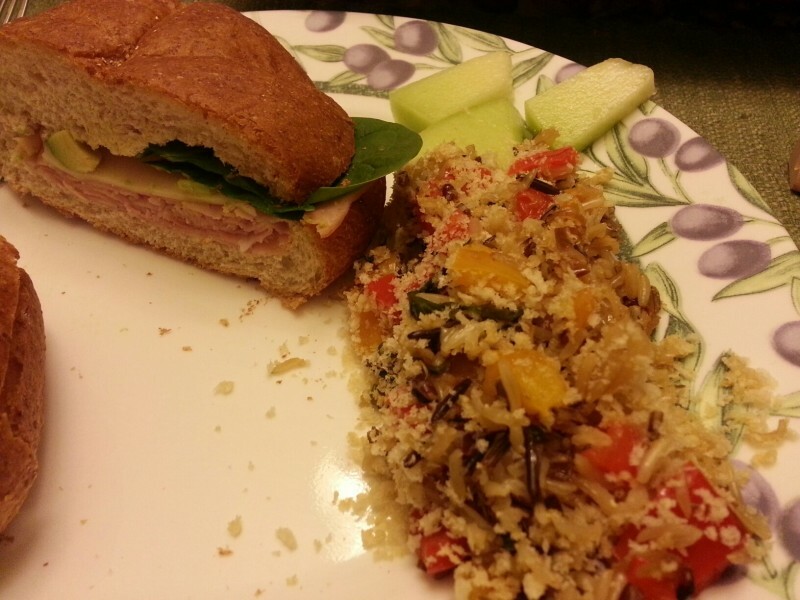 This was a nice healthy recipe that also tasted good. 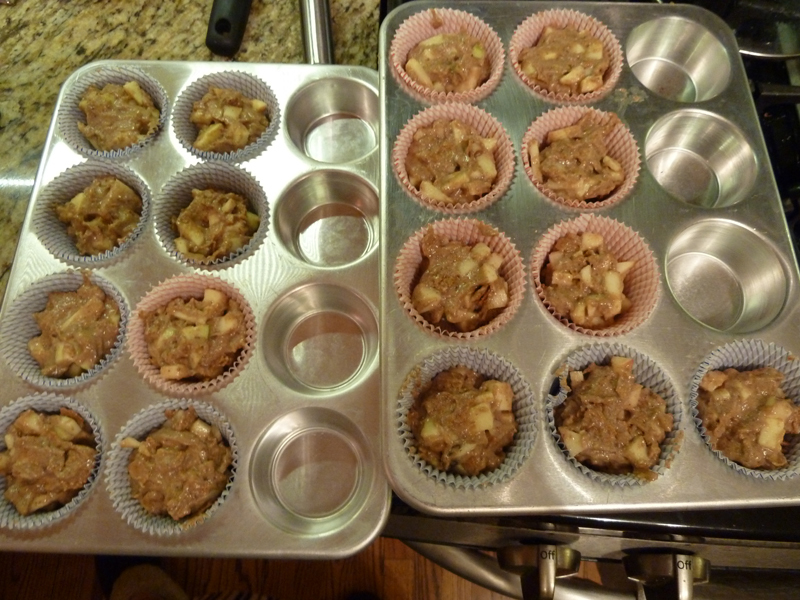 I liked how it used whole wheat flour, milled flax seed, and raisin bran (cereal) to add fiber and nutrition. Thanks to my sister-in-law, Ann, for telling me about it. The only changes I’d make a second time around is to further reduce the nutmeg and cloves, even though I already reduced them. Next time I’d just do a dash of each, they can be overpowering to me. 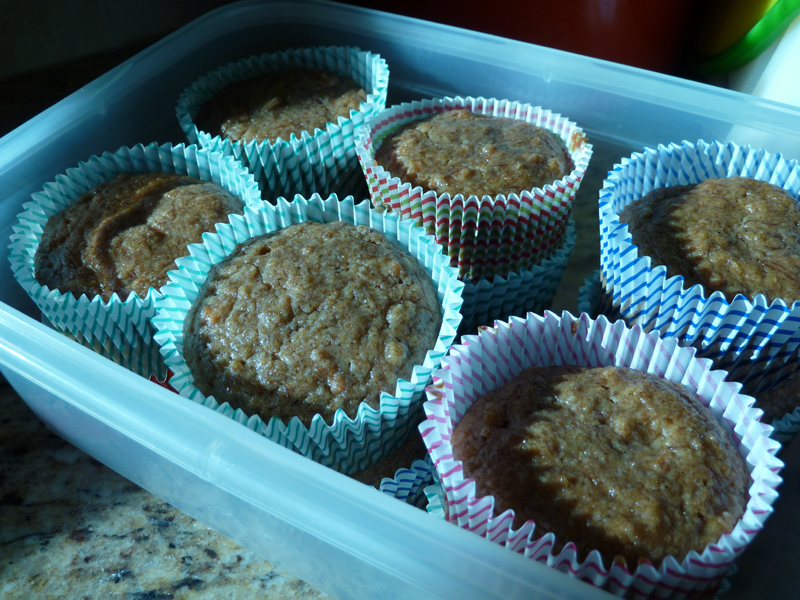 I used butter instead of margarine with no ill effects too Otherwise, great recipe! **To make this IC safe, maybe replace with plain bran. Make sure it doesn’t have cinnamon, a known irritant, or other irritants in it. Combine dry ingredients into large bowl. Combine wet ingredients into smaller bowl. Spoon into greased muffin tins up to the lip of the tin. Bake 15-30 minutes, depending on altitude (the higher the altitude, the longer you’ll need to cook them). To keep the ultimate amount of moisture while storing, place the muffins into a ziplock bag immediately after removing them from the oven (while still piping hot). Note: If you don’t have flax seed, add another egg and don’t add the 3 tablespoons of water. Note: The brown sugar can be substituted with the same amount of maple syrup.